Pasta is comfort food. You will not debate me on this fact. You can make something so comforting with just a couple ingredients, and it will be guaranteed delicious. Pasta aglio e olio, and cacio e pepe are two of my favorite most simplest pasta dishes ever created. They both need very little to be so delicious and satisfying. Both are perfect for a late night craving fix, as they come together in about 20 minutes. However, a real Italian will not hesitate to tell you that authentic cacio e pepe doesn’t contain garlic (or any other “fancy” toppings and additions). Aglio e olio pasta is the one with garlic (aglio = garlic). They both have cheese and both typically use spaghetti. But I don’t do authentic. Not because I don’t respect it, because I do, but I just like to do me while paying homage to the real thing. Besides, too many people want to argue about the authenticity of authenticity! It’s exhausting, and quite frankly, I don’t really care enough to donate my energy to something so silly — if it’s good, I’m gonna eat it. When you’re in the kitchen, you simply have to do what you want, and make what you feel like eating. 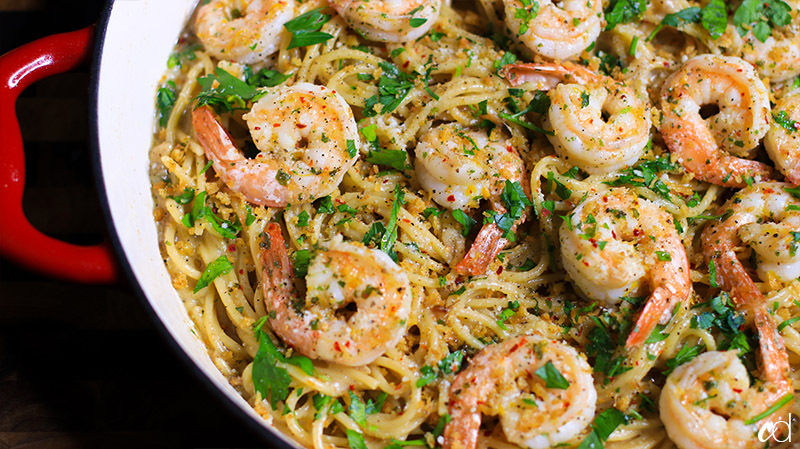 So, here you have *my* take on aglio cacio e pepe…with shrimp?? Or, con gamberetti?? And I have NO idea if that’s even a proper title for it, because I don’t speak the language, and therefore don’t really know how to arrange those words. 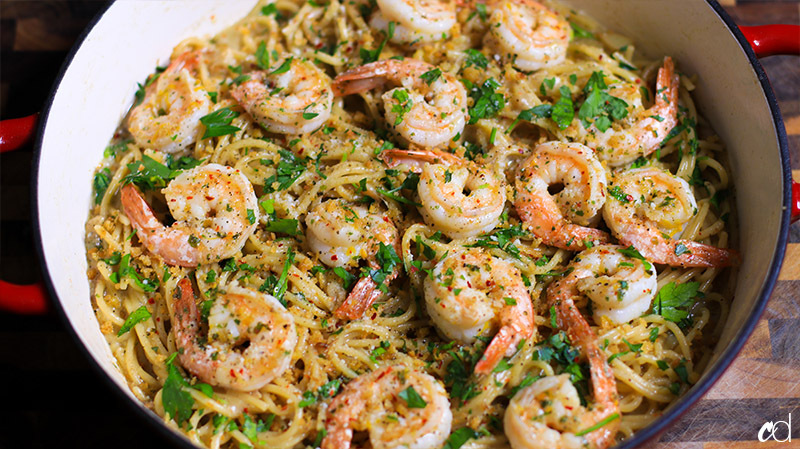 Basically, this is pasta with cheese, garlic, and juicy shrimp. 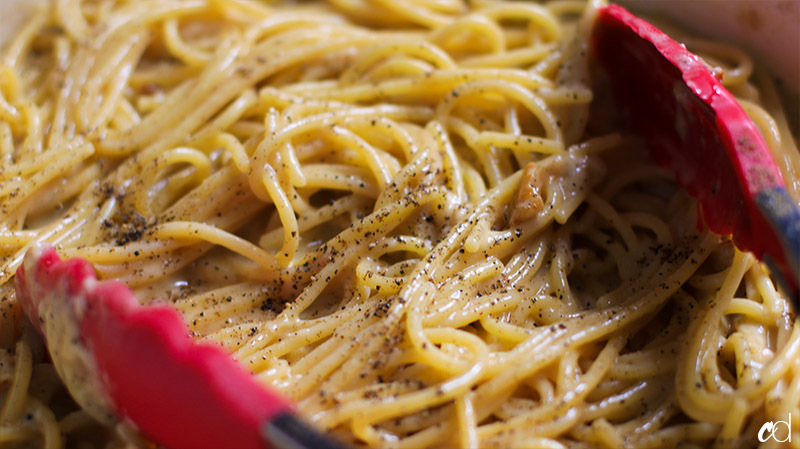 Cacio e pepe is very simple. The method to achieve it, takes just a little bit of practice, but it’s very easy to do. 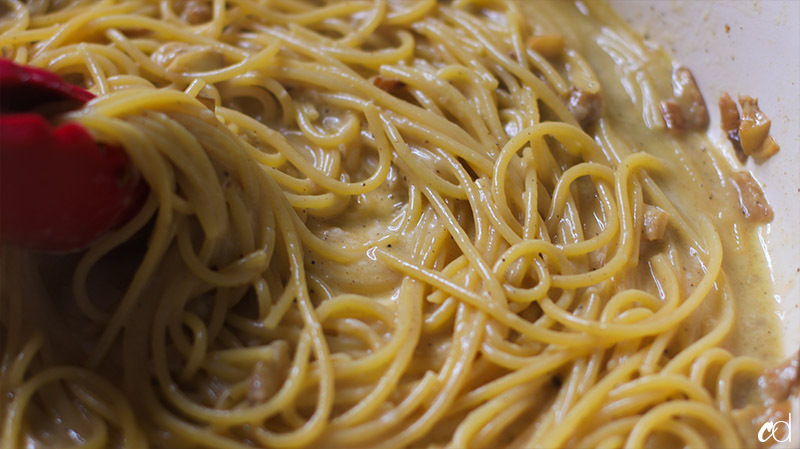 You basically use the starchy pasta water, and a little fat (olive oil and/or butter) to emulsify a sauce, while adding sharp pecorino romano cheese…and you end up with this creamy delicious sauce that clings beautifully to the pasta. Movement is your friend here. 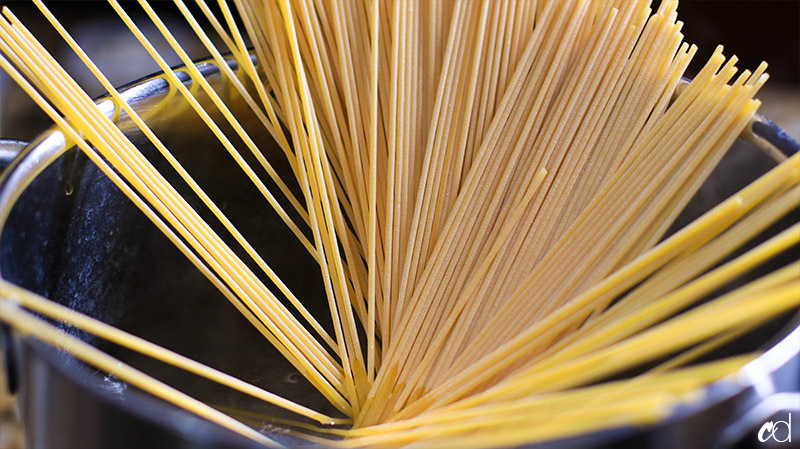 Keep the pasta moving while you mix it around, and the sauce comes together very easily. The main seasoning aside from the salty pasta water, is of course the freshly ground black pepper (pepe). The best way to infuse that floral peppery flavor is to gently infuse the olive oil with the pepper. And because I’m using elements of aglio e olio, do the same with the garlic. You can slice your garlic, or crush it and roughly chop it like I did. You don’t wanna use minced, because it will burn almost immediately. It’s too small. Larger chunks or slices of it, will yield a better flavor. It gets toasty and sweet, and way less harsh on the palate. You can use a combination of pecorino and parmigiano, but that’s totally up to you, toots. 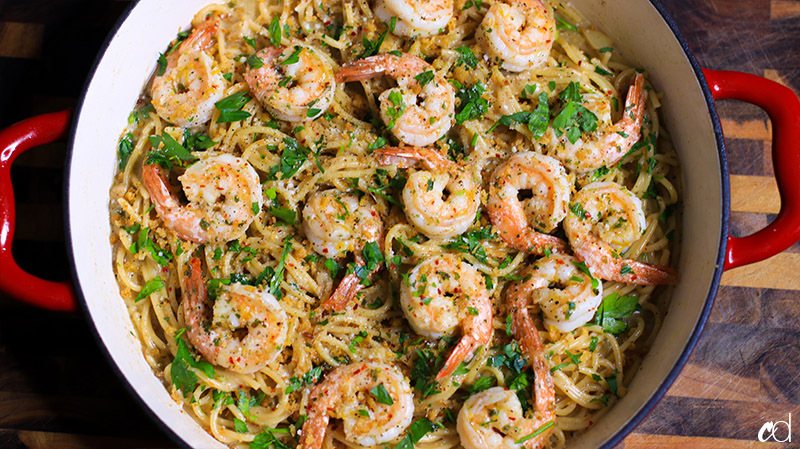 You can leave the shrimp out, or just swap it with another protein. That’s the beauty of cooking — you get to do whatever you want. I took about a half pound of thawed extra large shrimp and soaked them in a quick brine of kosher salt and raw sugar (equal parts). This method really helps enhance the shrimp’s natural sweetness and ocean’y saltiness, without being too much. Roughly chop some garlic, the amount is totally up to you. I used about 6 large cloves. Add the garlic, olive oil, and butter to a large skillet. Don’t forget the pepper! If you’re nervous, start with a little, you can always add more later. 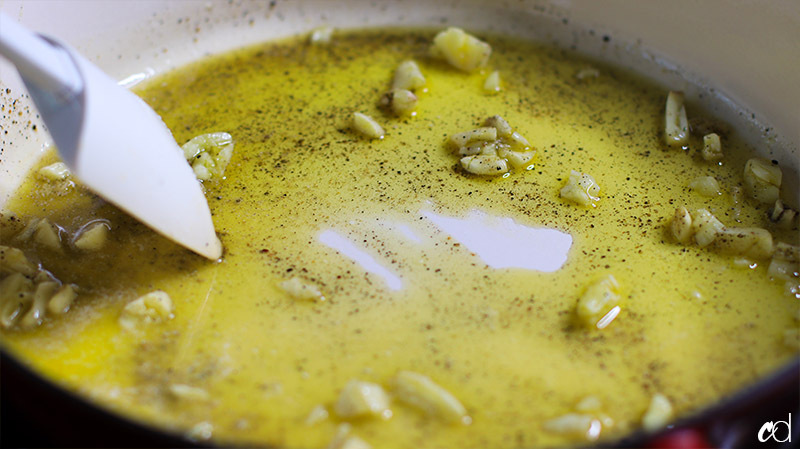 Bring the olive oil, butter, garlic, and black pepper to a gentle simmer over medium-low heat, stirring often. Meanwhile, bring about 4 inches of water in a large pot to a rumbling boil. Add sea salt and pasta. As the pasta begins to soften, gently twist and turn it so it all fits in the water. Don’t break your pasta!! I’m not even Italian and I know that’s a serious sin. Be gentle doing this though, you don’t want to break it. 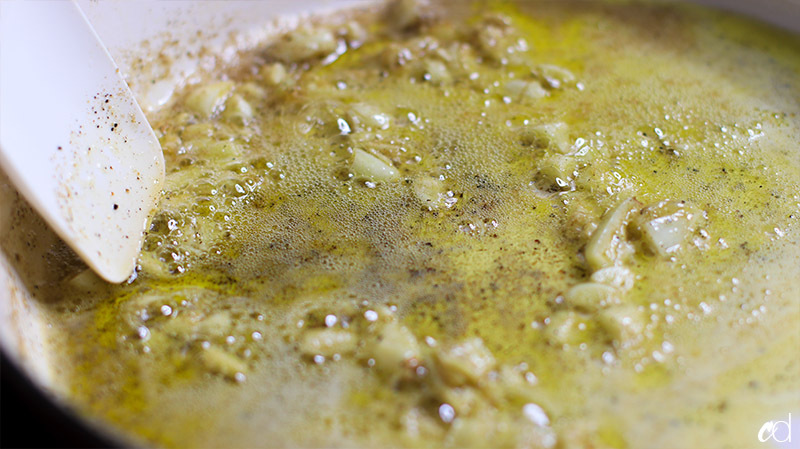 Continuously stir the garlic in the fat around so that it doesn’t burn. Also, because we’re using butter, the milk solids in the butter will brown, and we don’t want those to burn either. Just keep this moving, it’ll take about 5-7 minutes total. See how toasty the garlic is? This is perfect. 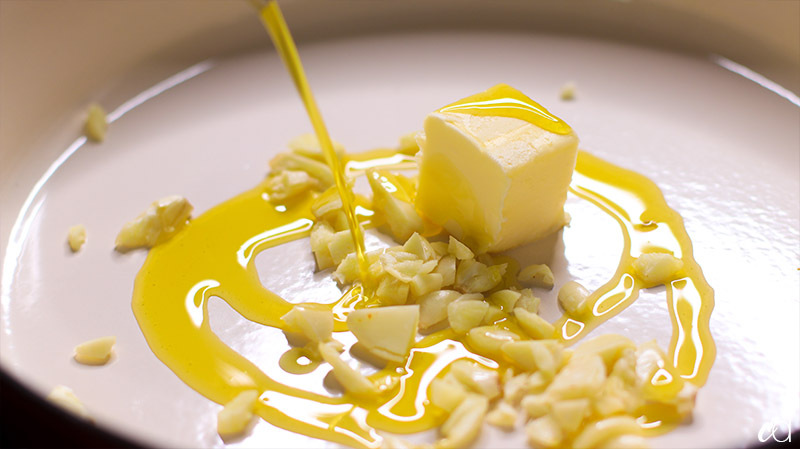 Now, add a ladle of starchy salty pasta water to the oil to slow down the cooking process so the garlic doesn’t get any darker. We’ve achieved this color because of the browned butter. But this is what it looks like with the water added. 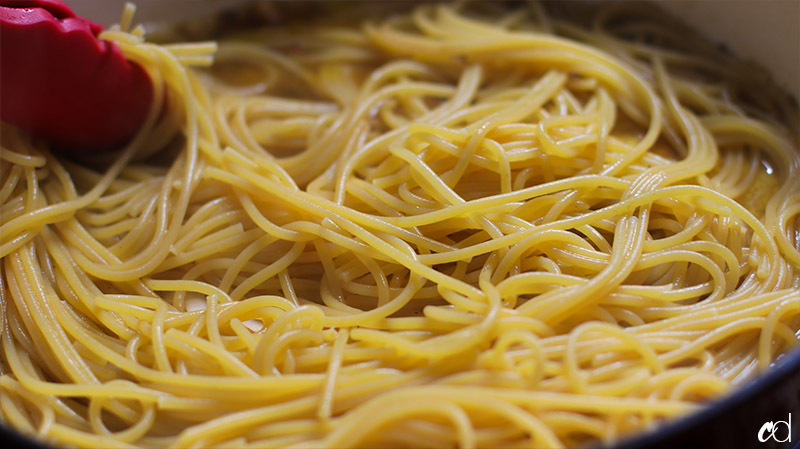 Add your al-dente pasta to the skillet, along with any water dripping of it. 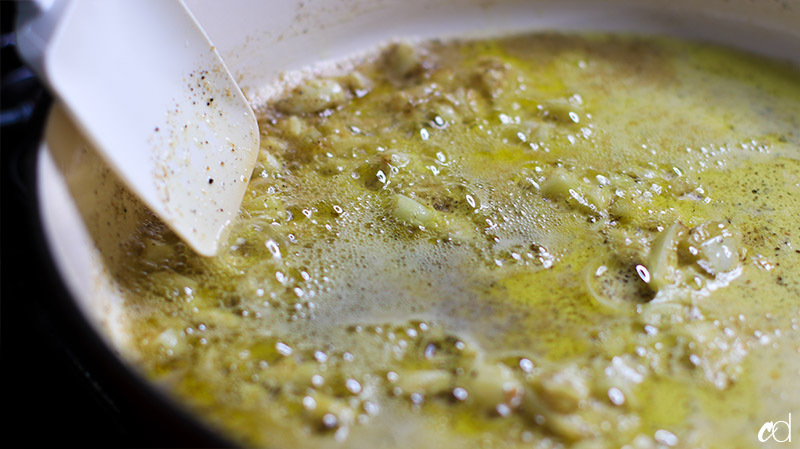 Stir around, adding 1 ladle of pasta water at a time until the water, olive oil, and butter start to emulsify. Add the cheese, while vigorously stirring the pasta. Keep stirring, the cheese will bring the sauce together. See how it’s clinging? 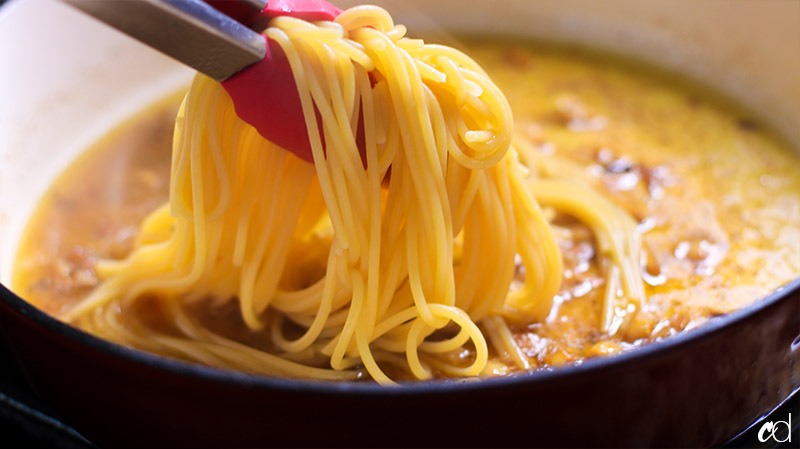 Continue to add small ladles of pasta water as needed until you’ve reached the consistency you want. Turn the heat off. Give it a taste, and add more black pepper if you need to. Cover and keep warm. Also, keep a cup of the hot starchy pasta water on hand just in case you need to adjust the consistency as it sits. Because the shrimp take about 2-3 minutes to cook, you can do this at the very last couple of minutes. Simply saute them in a drizzle of butter and/or olive oil for 1 and a half minutes per side. Turn the heat off and add a fresh squeeze of lemon. 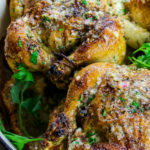 If you want, you can top your whole dish with toasted buttered breadcrumbs, and you have a whole entire meal that was done quickly, and simply. Tell your nonna I’m sorry, but I do what I want. Add the shrimp to a small bowl or large measuring cup, along with the kosher salt, sugar, and zest. Add just enough cold water to cover it, and stir to dissolve the salt and sugar. Let sit for 20 minutes. 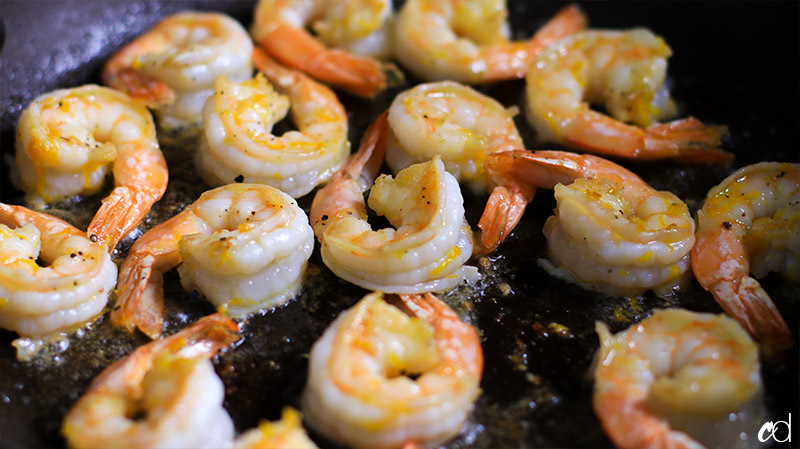 After 20 minutes, rinse and drain the shrimp on paper towels. 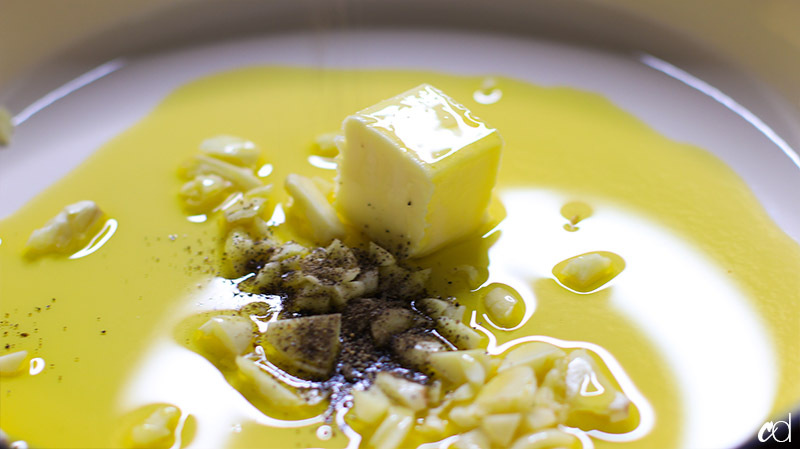 When ready to cook, heat about 2 tablespoons of olive oil and 1 tablespoon of butter over medium-high heat. 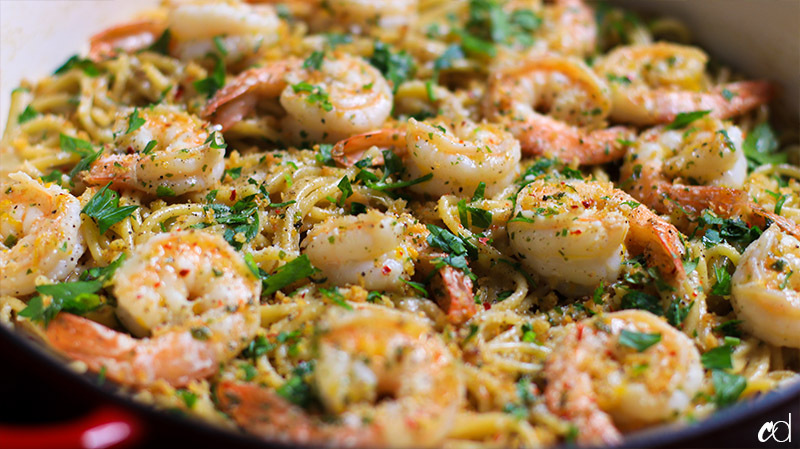 Add crushed red pepper if using, and saute shrimp for 1-2 minutes per side. If using smaller shrimp, adjust the cooking time as needed. You don’t want rubbery overcooked shrimp. When shrimp is opaque and pink, turn off the heat, toss the shrimp in the oil and butter mixture, and add a splash of lemon juice. 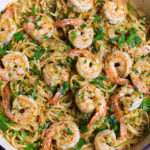 Add the shrimp to the pasta dish and enjoy. Bring a quart of water to a boil in a pot, adding a very large pinch of sea salt once it starts boiling. Add the spaghetti, gently folding it in so it fits under the water. We are using far less water here on purpose — we want extra starchy pasta water. 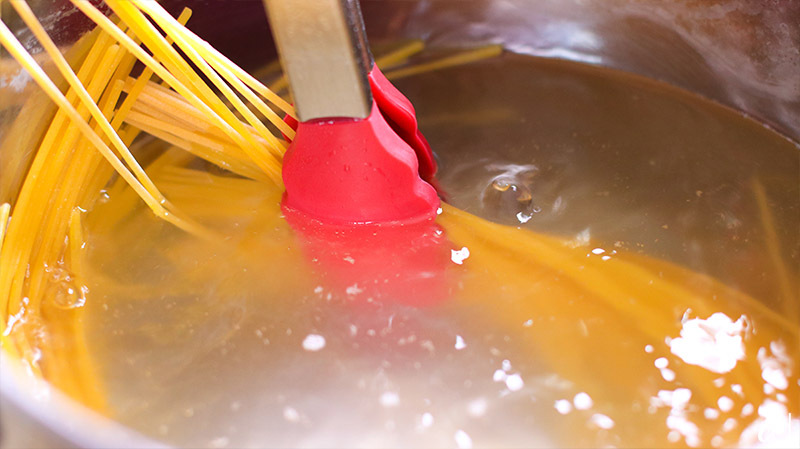 Do NOT break the spaghetti, just be patient and gently swirl it in until its submerged. Cook according to package directions, minus 2 minutes. Meanwhile in a large skillet over medium-low to medium heat, bring the olive oil, butter, black pepper, and garlic to a gentle simmer. Stir the garlic around frequently so it doesn’t burn. Also, because we’re using butter, the milk solids will brown over time. Keep this mixture moving so nothing burns. You want the garlic to be toasty and straw colored at the most. This will cook for about 5-7 minutes. 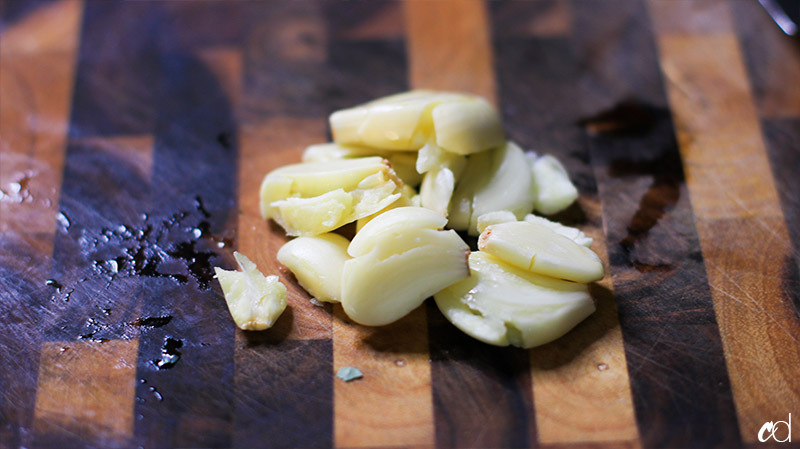 Once the garlic is toasty and lightly golden brown around the edges, reduce the heat to low. 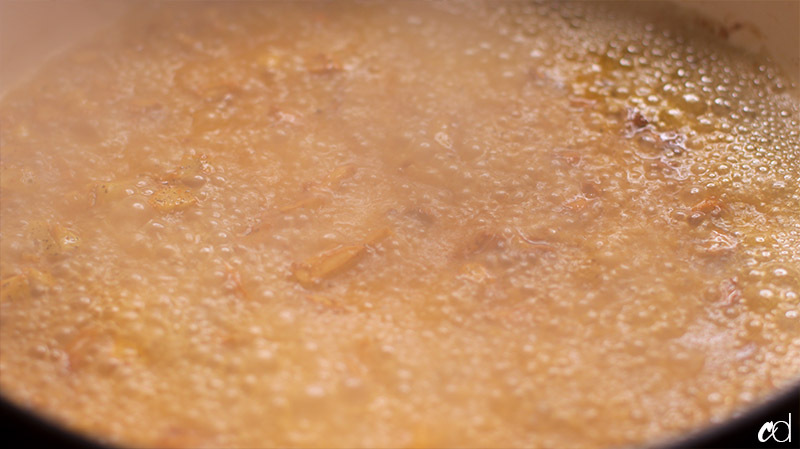 Add a ladle of the hot starchy pasta water to slow down the cooking process. 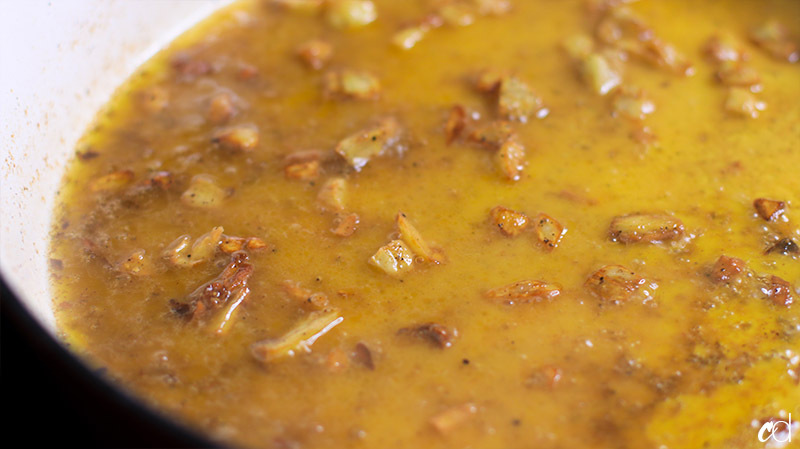 Stir around to scrape up any browned bits (if you have any). Add another ladle of the pasta water, then add the pasta. Keep the pasta water nearby because this is what the base of our sauce will be comprised of. 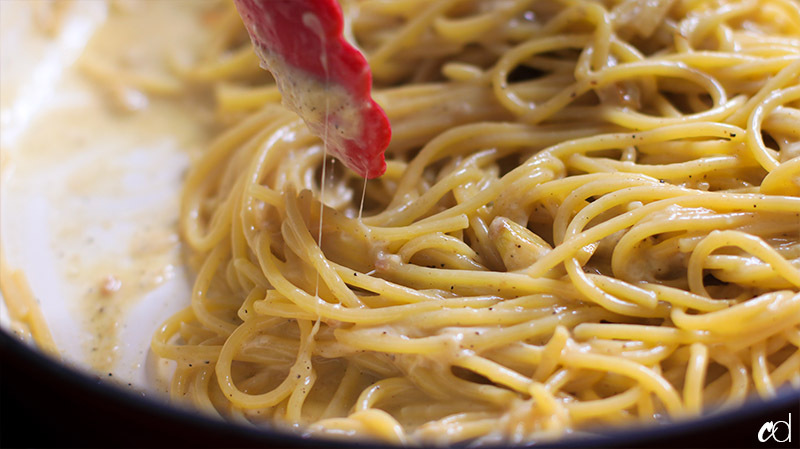 As soon as you add the pasta, stir vigorously to coat each strand in the oil/butter and water mixture. It should begin to emulsify. 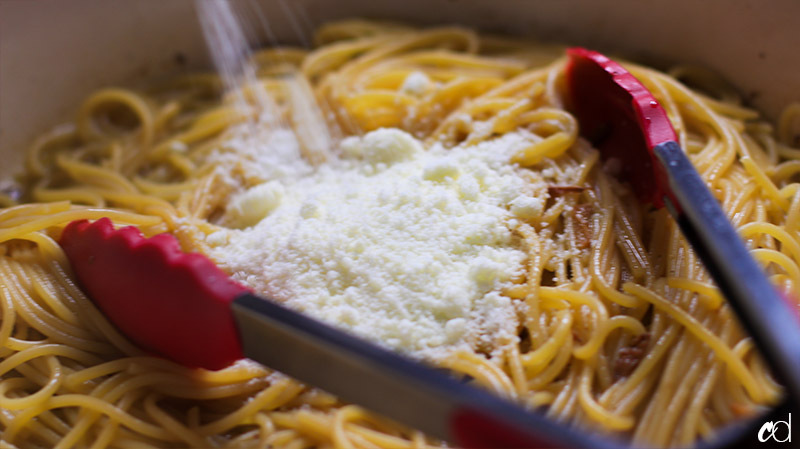 Immediately add the pecorino romano while stirring and mixing until it’s creamy and fully emulsified. Continue to add starchy pasta water until it’s the consistency you prefer. Taste and adjust with salt and pepper as needed. Cover and keep warm. 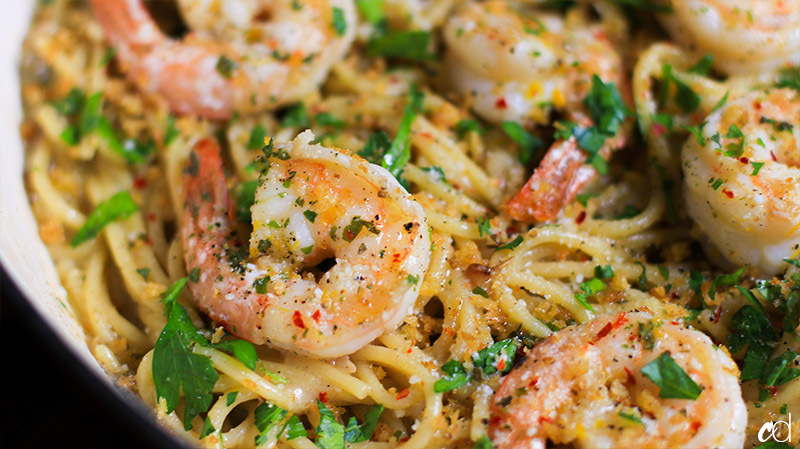 Keep the pasta water to later adjust the consistency while you prepare the shrimp. 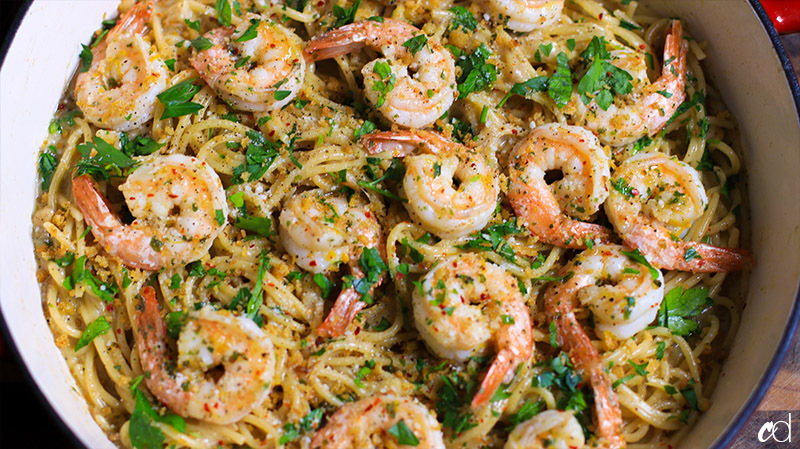 Top the pasta with shrimp, fresh parsley, more pecorino, and toasted breadcrumbs (if using). I left the tails on my shrimp because that’s just how we preferred to eat them at this time, but you can absolutely remove them! A quick recipe for toasted breadcrumbs. 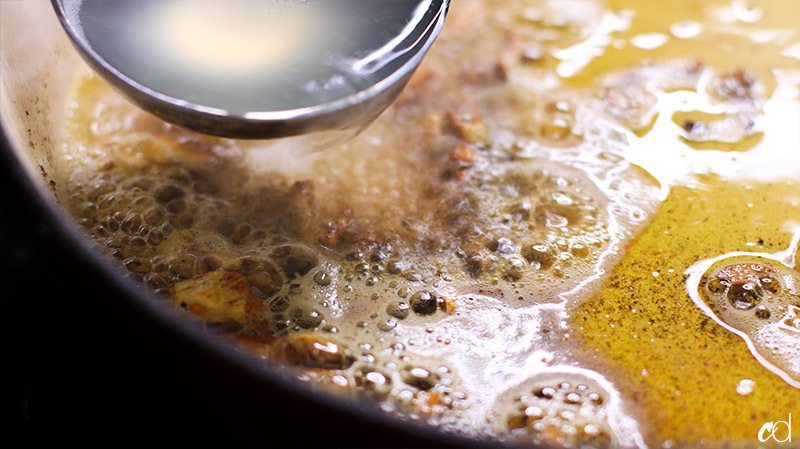 Add 2 tablespoons of olive oil or butter (or both), to a small skillet over medium heat, along with 1 cup of panko bread crumbs. Toss to coat, making sure every piece is evenly moistened, but not too greasy. 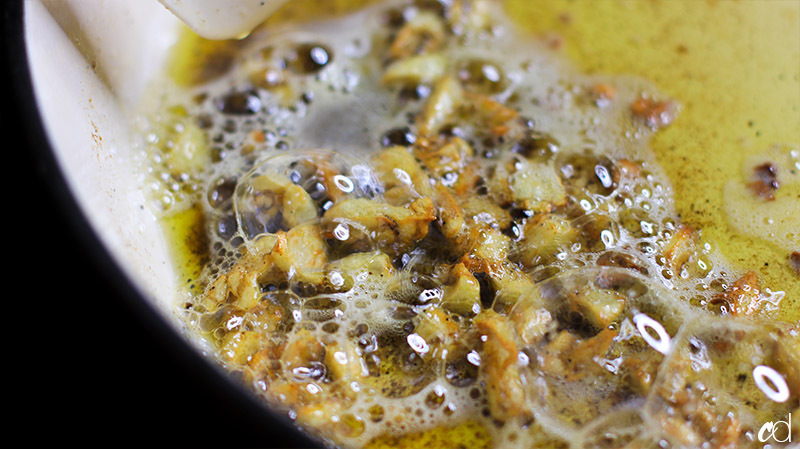 Adjust amounts of fat and crumbs as needed. Continuously toss the crumbs around until they’re lightly golden brown and toasted through. Feel free to season with dried or fresh herbs, salt, pepper, and whatever you choose. I just made this tonight (eating it as I type this actually) and it is so good! I was a little nervous just because I’m not much of a cook but I know how to follow instructions and it is perfect. I used fettuccine noodles instead since that was all I had and it is just as good. I think next time I’ll add more shrimp just because who doesn’t love extra shrimp?! Thanks for posting. Eating this as I type. This is delicious. My only regret is picking up the wrong size shrimp as I had the small shrimp. Next time, I’m going BIG! !